You’ve been wanting to start a blog that is professional and modern, but you don’t know where to start. You’ve come to the right place. This guide will show you how to create a website or start blog for business or pleasure. I’ll walk you through each of the 5 steps that I’ve done to launch all of my sites. Some of the links below are affiliate links, meaning, at no additional cost to you, I will earn a commission if you choose to make a purchase. Thank you for your support in this way. Please only make these purchases if you are in a financial position to do so, and are serious about starting a website. After reading this guide, you’ll know how to create a self-hosted WordPress site, a platform with over 75 million sites and how 20% of all sites are created. I remember when I wanted to create my own custom website, it was so hard to figure out everything – from hosting to WordPress to themes. That’s why I created this guide – to walk you through each step. Truly, I hope this guide will help you get started with your brand new website. Let’s go! Web hosting is the virtual space needed to store the data of your website. To create a fully customizable website, I highly recommend choosing the self-hosting route. VideoSchoolOnline.com was my first self-hosted website, and since then I’ve created dozens of self-hosted websites without looking back. Sign up for Bluehost by clicking here (clicking this link will open a new window so you can work while you read through this guide). I highly recommend Bluehost because of their unlimited domain hosting, space, email accounts, superior customer service. I’ve never had a problem with them. The support that Bluehost offers is amazing. 24-7, they’re available to help. 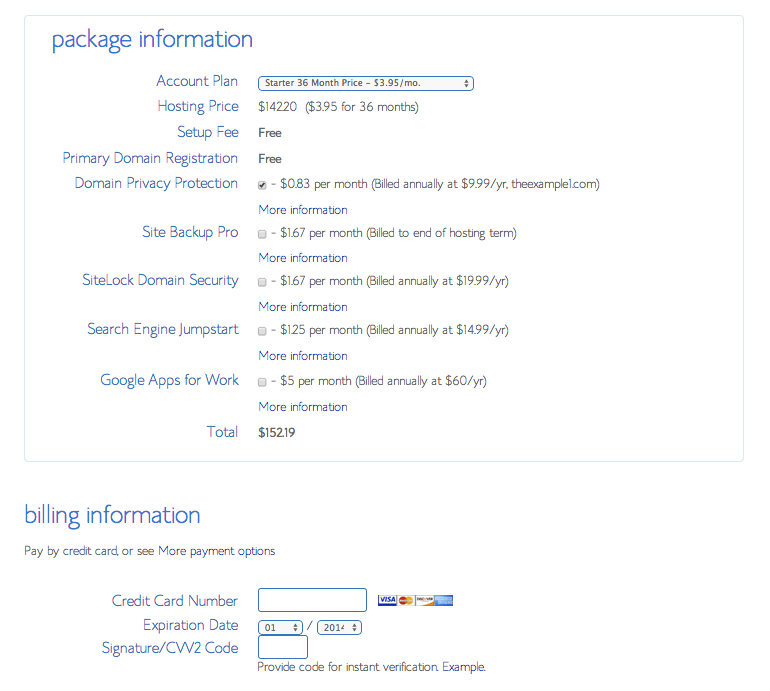 Affordability is the pride and joy of Bluehost. you get unlimited space, bandwidth, domains, and email accounts for a very inexpensive price. Around $4 for hosting is an incredible deal that can’t be beat anywhere else. My sites are so reliable. I’ve never had an issue with my site going down. And according to the besthostratings, they have an uptime report of 99.9%. My site has never gone down because of Bluehost. And whenever I’ve had a problem on my end, they’re always there to help. It is just so easy to use their hosting dashboard. I can easily add new domains, install WordPress, create a new email account, and much more. I think all of those reasons are enough to convince you that Bluehost is the way to go! Just click the green get started now button to sign up. All of the images you’ll see in this guide might look slightly different than what you’re seeing on Bluehost. They’re constantly improving their sites, but the general process is the same. 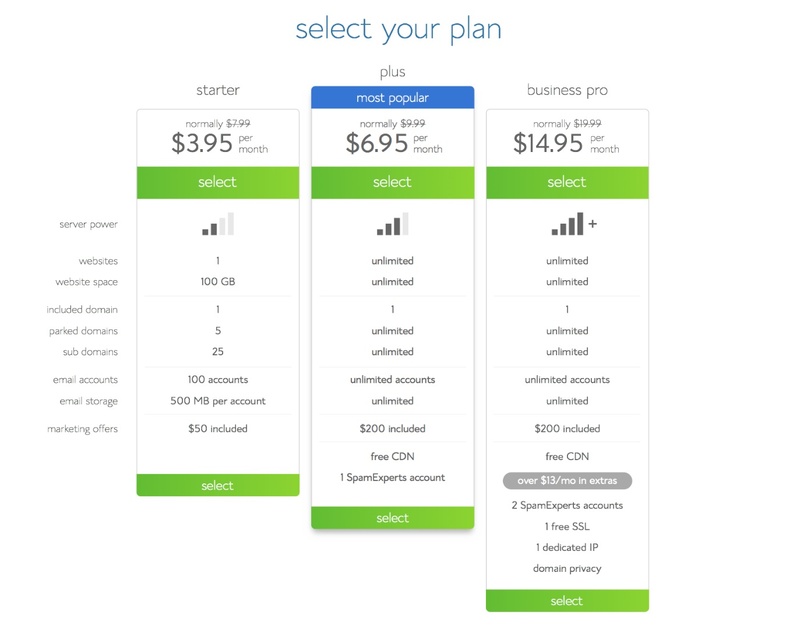 Bluehost offers three different options for plans. With the plus plan, you’ll get unlimited websites, space, email accounts, and more bonuses. This is the plan I use. If you’re absolutely sure that you’ll only have one site without much data, go ahead with the starter plan. Note that you can upgrade at any time. All of the plans come with a free domain. Just click one of the green select buttons to continue. Here’s the fun part! You get to select a domain name for your site. This is the web address that people will type in to their web browser to get to your website. Hopefully you have something in mind for you domain name, but if not here are some tips for choosing a great domain. Choose something that is memorable – that means easy to say and spell. Use a .com if possible (no .info, .net, or .biz addresses here!). Make it keyword friendly (i.e. videoschoolonline includes the keywords video, online, and school) and relevant to your site topic. Don’t use any numbers or symbols. If you already have a domain name registered elsewhere, type it in on the right and click next. Otherwise, just type it in on the left. The next page asks you to enter your account info. Make sure to use an email address that you currently use because they’ll send you your login information including username and password. Below you’ll have to choose the Account Plan. You’ll be billed one year at a time and the more years you purchase, the cheaper you’ll pay per year. I started with the 36-month plan and have renewed since. There are some other add-ons that you can consider like Site Backup Pro, Search Engine Jumpstart, Google Apps for Work, and SiteLock Domain Security. But you can install free plugins that do basically the same thing later on. The only thing I would recommend is the Domain Privacy Protection. 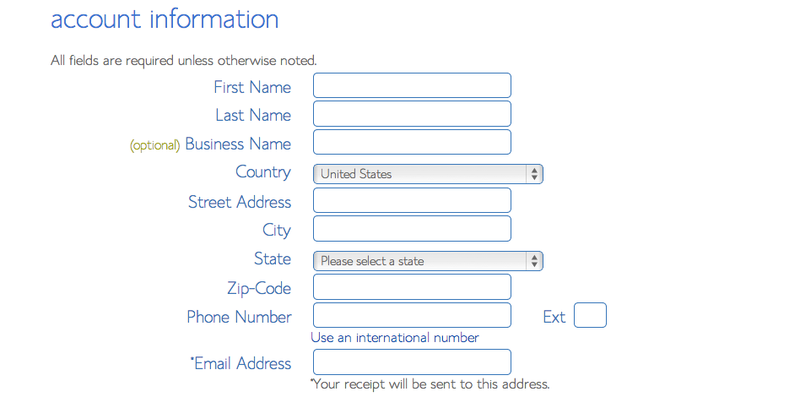 Without this, your account info from above (address, phone, name) will be available as public domain information. With the Privacy Protection, your personal information can’t be viewed. Below the package information, pay with a credit or PayPal (click the more payment options button to pay with PayPal). On the next page, you’ll be offered different types of upgrades like theme options. Just skip these, and we’ll add a perfect them later. Check your email and you’ll get a purchase confirmation that includes your control panel (cpanel) login information. Make sure to keep this info for future reference. I know that I’ve lost it many times in the past and had to reset my password a handful of times. You’ve now completed the first two steps – purchasing hosting and your domain. 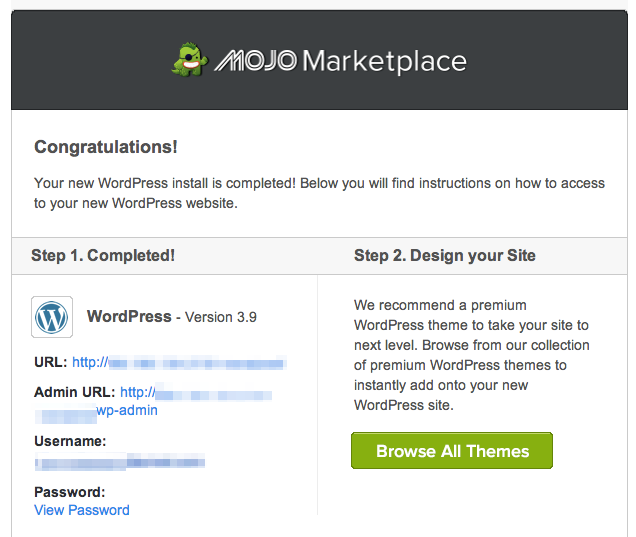 Now let’s move on to installing WordPress to your site. WordPress is the internet application where you’ll be able to actually build your site. 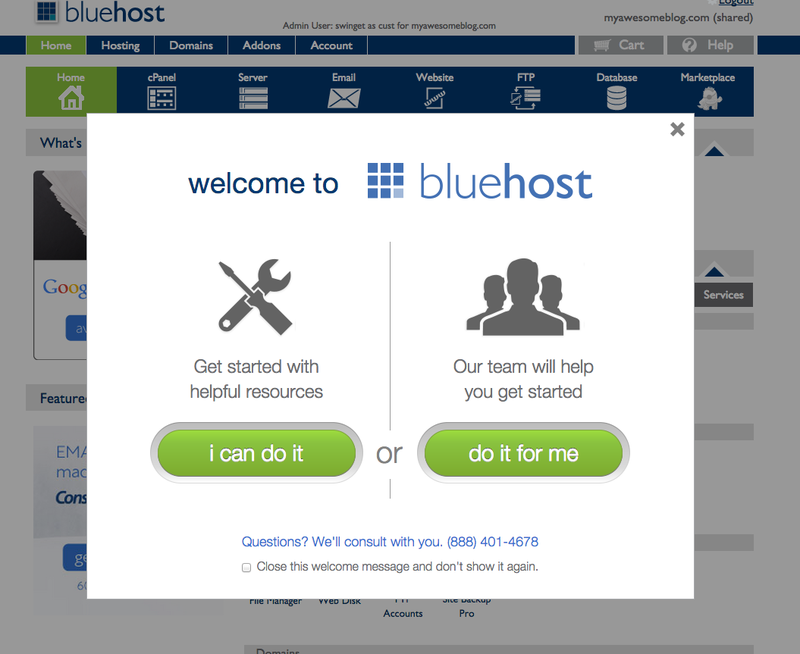 Head back to BlueHost and login by clicking the login button in the top right. Enter the cpanel login info from the welcome email. Click on the hosting button on the top left of the main menu. Click the green i can do it button (because I know you can do it! I’m showing you exactly how now). 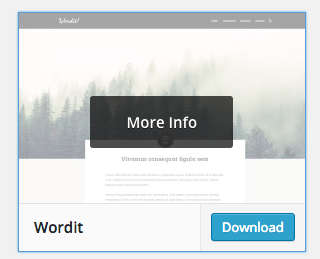 Click the install wordpress button underneath the website window about half-way down the screen. You’ll be taken to a page with two options: do it yourself (FREE) or let us do it for you (PAID). I like free things, so we’re going to do it the free way. So click the green install button. 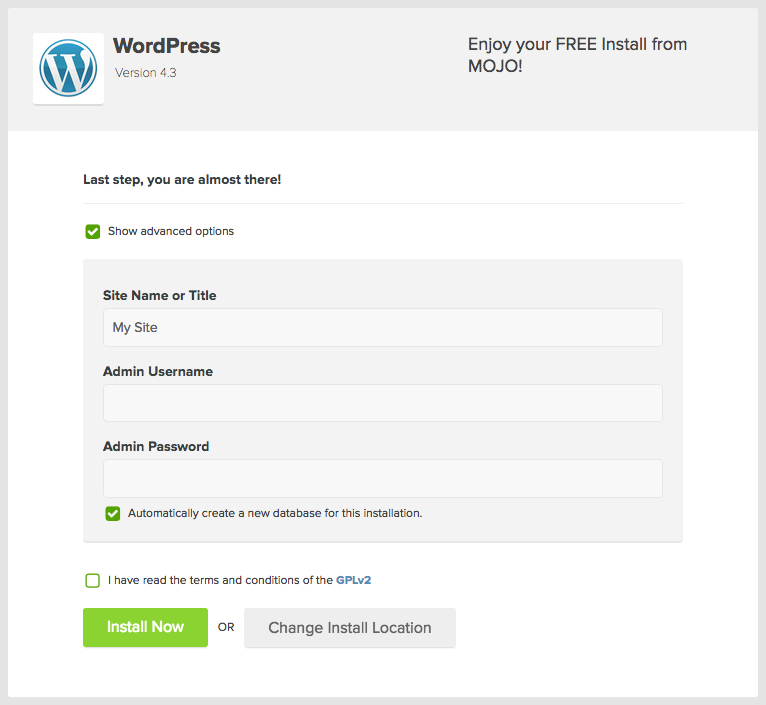 Choose the domain from the drop-down menu that you’d like to install wordpress to. Use the one with www. This is where WordPress will be installed. Then click the green check domain button. 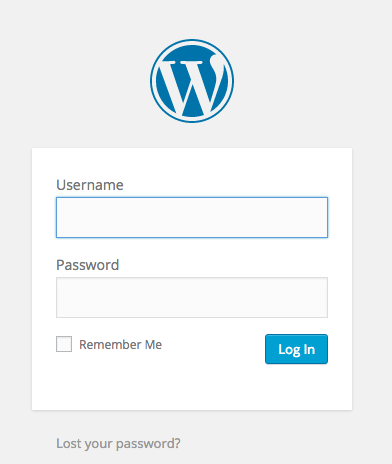 The next step is to enter your WordPress user information. Click the show advanced options check box to change the Site Name or Title, Admin Username, and Admin Password. These can all be changed later, but choose something that you’ll remember. This info will be emailed to you. Read the terms and conditions, check the box, and click the green install now button. It will take a minute or two for the installation to complete. Once it is finished, click the view credentials link at the top of the page. Take note of all of the information on this new page. It will include your website url, the login url (this is the url you’ll go to, to actually log into your website to make changes), your username, and password. All of this info will be emailed to you. You now have a website! What’s next? Now that you have a website, it’s time to start building it. Think of your website theme as the skin or the design. You’ll have to create the structure of your website, but the theme can changed without affecting the structure. There are thousands of themes (free and paid) that come in a variety of styles including: blog, corporate, ecommerce, creative, portfolio, mobile, nonprofit, technology, wedding, education, entertainment, magazine, etc. 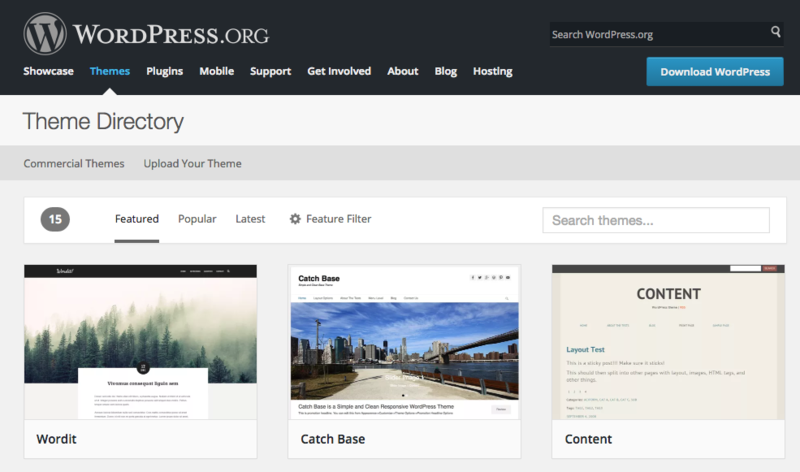 My favorite place to find free themes is the WordPress.org theme directory. Search or browse through the themes to find one that you like. Hover over a theme to find out more information or download the theme file. Once you download the file, leave it as a .zip file. We’ll be using that file to install later. 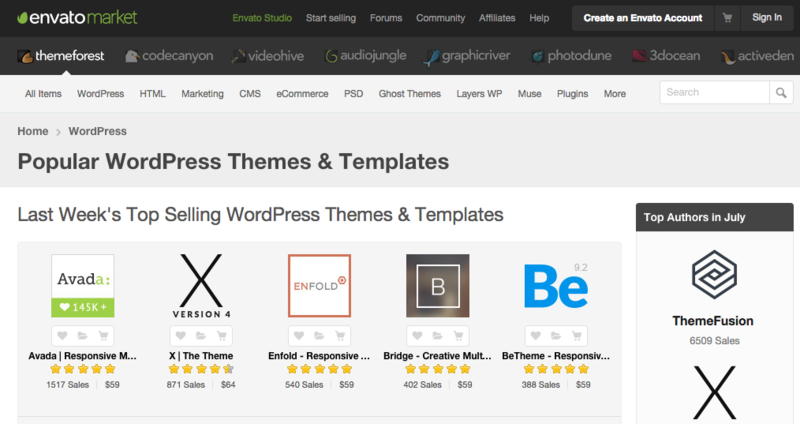 My favorite place to find paid themes is ThemeForest.net. They have a library of professional themes that offer more customizability, better features, and support. 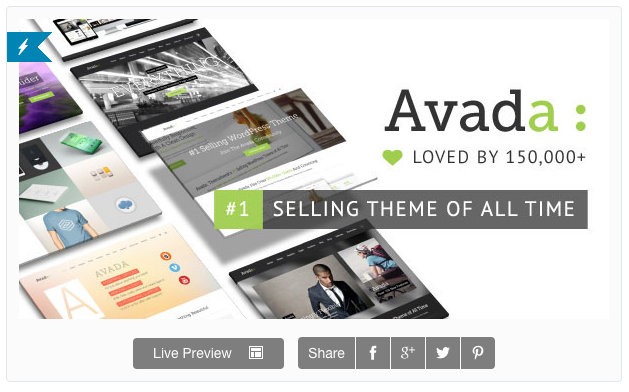 Video School Online is using the Avada theme, which is the most popular theme sold on themeforest. Browse through the library of themes on either wordpress.org or themeforest.net and download a theme that you like. 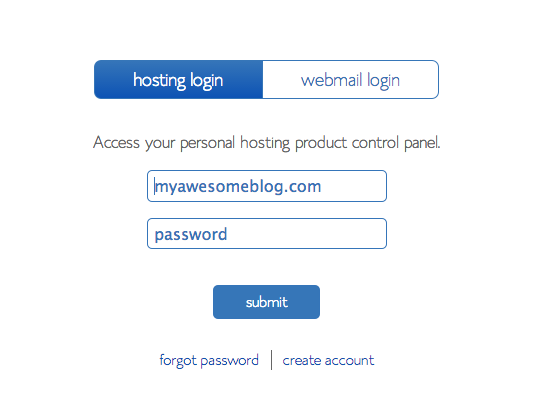 Log into your website using the wp-admin address and the user credentials you saved. You’ll then be on your website’s dashboard. Hover over the appearance link on the left-hand side navigation bar, then click the themes link. 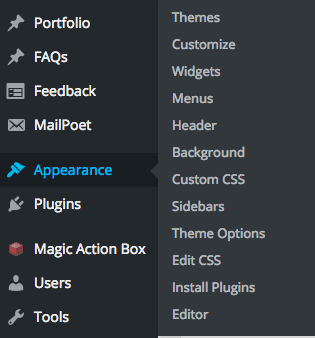 You’ll see the pre-installed themes that come with your WordPress installation. Click on the add new button on the top of this window. Then click the upload theme button. Click the choose file button. Find the .zip file that you downloaded earlier. Then click the install now button. After it uploads properly, click the activate button. This will finish the theme installation process. Hove over your site title in the top left, and click visit site to check that your new theme has been installed. Congrats! You now have installed a new theme to your blog. A while back, I created a series of videos on how to use WordPress for beginners. This series of videos will show you how to add a post, how to add a page, how to customize your menu, and how to add widgets to your site. The following videos in the playlist are a great guide to building your site. Note that these tutorials were created a couple years ago and the layout of WordPress looks a little different. But the process is still the same as in the videos. I also recommend the WP101 tutorial series that walks you through every question you’ll have in regards to creating your website. Once you’ve created your website, please share it with me and the rest of the readers in the comments below. We’ll be your first website fans! Then share it with the world on social media and beyond! Thank you so much for reading this guide on how to create a website in 5 steps. I really hope it has helped you. I know that when I started, it took me a while to get comfortable with creating and designing new websites. So hopefully this made it a bit easier for you. Let me know if any was confusing or not clear in the comments below, and I’ll give you more information.